Ambassadors are an elite group of individuals who volunteer and assist at various Chamber events. Being an ambassador is the perfect way to network and meet new people while supporting the community and your Chamber. 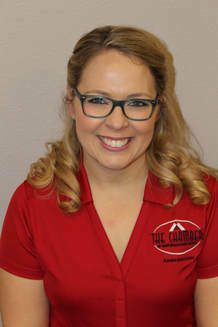 Ambassadors are organized to represent The Chamber membership and Board of Directors at official Chamber functions, such as grand openings, ribbon cuttings and ground-breakings, the welcoming of visiting dignitaries, opening ceremonies of community events, and other official functions of the Chamber. Any member of The Chamber of Medford/Jackson County, in good standing, is eligible to apply for membership in the Ambassadors. Any person performing services for The Chamber on a contractual or commission basis is also eligible for membership in the Ambassadors. Interested in becoming a Chamber Ambassador? Contact us today!